Exodus, a fundamental experience of vocation: The Good Shepherd knows, calls, feeds, and guides his sheep. Pray that “the Lord of the harvest send laborers into his harvest.” Jesus called not only the Apostles but 72 more disciples. Our vocation is born of mission. Hearing and following the Good Shepherd means letting him guide us, allowing the Spirit to draw us into missionary dynamism, awakening the desire, joy, and courage to offer our lives in service. I can only offer my life if I leave myself behind; that “exodus” is the heart of our response to the vocation God gives us. “Exodus” evokes Moses and the journey to the Promised Land. Exodus is a parable of salvation history but also faith's inner workings. Passing from slavery to new life is a event of redemption that takes place through faith; “exodus,” the journey of each Christian and the whole Church, turning towards the Father, is at the root of every Christian vocation. Belief means transcending ourselves, leaving behind our comfort and inflexible ego to center our life in Christ, going forward with trust, knowing God will show us the way. It's not contempt for my life, feelings, or humanity but rather putting ourselves at God's service, rooted in love. Our vocation is a call to love that draws us out of ourselves and triggers an exodus out of our closed self towards liberation through self-giving, self-discovery, and discovery of God. Exodus calls for a constantly renewed attitude of conversion and transformation, moving forward, passing from death to life. From Abraham's and Moses' calls and Israel’s journey to Jesus' journey culminating in his resurrection, vocation is God's work; he leads us, frees us, breaks down our habits and indifference, and brings us to the joy of communion with him and others. Responding to God’s call is leaving ourselves behind and striking out on the path leading to Christ. The Church is faithful when she “goes forth,” meeting God’s children wherever they are, feeling compassion. God goes forth in a Trinitarian dynamic of love, hearing our cry and intervening to set us free; similarly, we're called to go out to encounter humanity, proclaiming the Gospel's liberating word, healing wounds with God's grace, and relieving the poor and suffering. This exodus also represents the way for us to understand our humanity and foster the development of individuals and societies. Hearing and answering God's call is a specific, real, total commitment embracing our existence and setting it at the service of God’s Kingdom. Friendship with the Lord isn't flight from life or the world but rather involves profound interplay between communion and mission. Exodus fills our lives with joy and meaning. Go out and begin the journey! The Gospel brings freedom, transforms our lives, making them more beautiful. Mary, never afraid to utter fiat, is at our side to guide us. With courage she sang of the joy of leaving herself behind and entrusting her plans to God. Turn to her, be open to God's plans for you, and go out with tender concern to others. Ps 118:1, 8-9, 21-23, 26, 28-29 "The stone rejected by the builders has become the cornerstone." Give thanks to the Lord; his mercy endures forever. Take refuge in the Lord. You answered and saved me. 1 Jn 3:1-2 See what love the Father bestowed on us, that we may be called his children. The world doesn't know us because it didn't know him. We're God’s children now, and we'll be like him, for we'll see him as he is. Creighton: Jesus the Good Shepherd is the cornerstone of our faith. The Risen Jesus dwells within us and we become part of God’s own family, ”See what love the Father has bestowed on us that we may be called children of God.” Rejoice in God's gift to us through the Resurrected Jesus! One Bread One Body: "The life of a sheep": To be called a sheep is no compliment. Sheep are backward and timid; they can't eat grass without destroying the field. When Jesus called us sheep, he implied we were helpless. Without him we can do nothing. What will we do when thieves or wolves come? Some wolves are in sheep's clothing, and some "shepherds" are really hired hands who will abandon us. 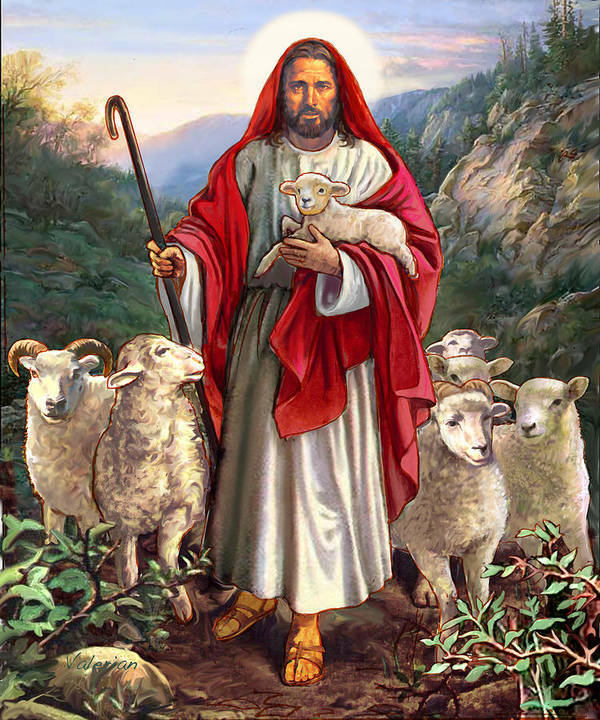 We sheep are simple, weak, and in trouble, but the Good Shepherd is our hope. Passionist: Early Christians knew what shepherds were, what kind of life they lived, and what dangers sheep and shepherd faced. In the face of persecution and martyrdom, the Good Shepherd was there for them. 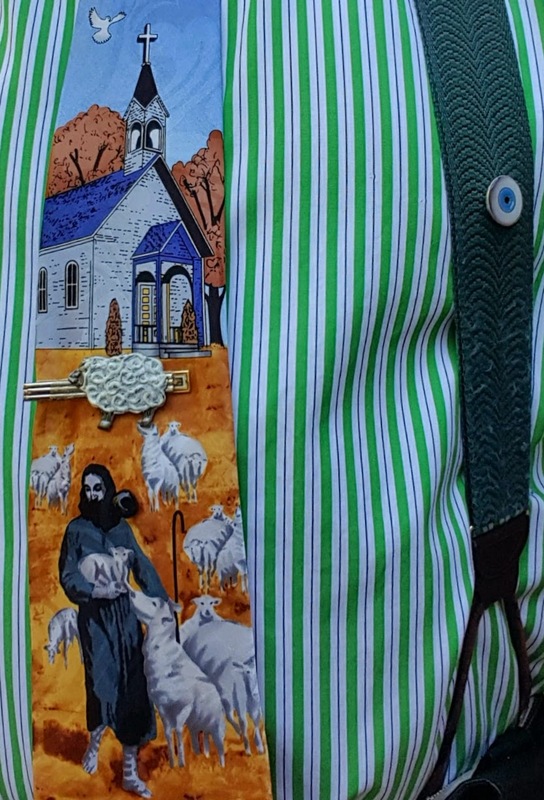 The Good Shepherd image Pope Francis uses isn't the handsome, clean one from art but one of a real shepherd living a hard life in the field and smelling like sheep. Jesus loves us enough to take on the messy and smelly side of our lives. He chooses to live with us, to seek us when we stray, to carry us when we're tired, to lead us to green pastures, to lay down his life for us. He wants us to be shepherds to the sheep given to us. How do we lay down our lives for them? DailyScripture.net: The Old Testament speaks of God as shepherd of his people. The Lord is my shepherd. Give ear, O Shepherd of Israel! We are the sheep of his pasture. 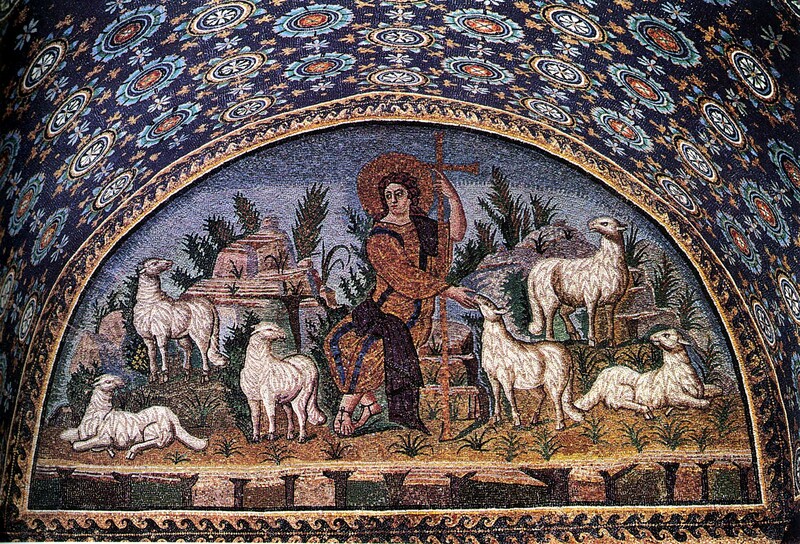 The Messiah is pictured as shepherd: He will feed his flock like a shepherd. Jesus says he is the Good Shepherd who will risk his life to seek out and save the stray; he's the Shepherd and Guardian of our souls.